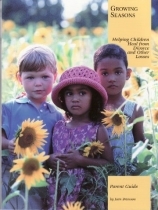 Growing Seasons is a Christcentered small group curriculum published by Living Free Ministries (livingfree.org.) Churches and other Christian organizations develop groups to help children ages four through twelve talk about their feelings, forgive, and heal. These guidelines are excerpts from the Parents Orientation, pages 60-63. Avoid Role Reversal. Let your child needs be a child and you need be the parent. It is not healthy for children to attempt to take the place of their absent parent. Watch for signs of over responsibility and urge your kids to take time to play. Would you comment on some ways you have helped your children to let you be the parent? Apply Proper Discipline. When you, the parent, are grieving a loss because of the death of a family member or a divorce, it is often difficult to apply the proper discipline. You may not want to risk alienating your child or you may feel sorry for him or her. You may lack the emotional energy required to apply discipline. Remember that during this time your child is vulnerable and needs loving discipline to feel secure. Do you have any ideas on ways to discipline a grieving child? Avoid Involving Your Child in Money Problems. Money problems are adult problems. Your child can understand that you can not afford a certain desired item without knowing all the details. When you attempt to buy the love of children, you risk giving them the message that their own value comes from the amount of money spent on them. When you discuss child support issues in front of your child, you can cause anger, fear, and confusion. How do you explain to your children that they can not have everything they want? Be Sure to Deal with Your Child’s Guilt Feelings. Children believe their thoughts somehow control their environment and the world revolves around them. Remind them often that they did nothing to cause their loss. You don’t need to blame it on anyone. Tell them it is a grown-up problem. Allow Your Child to Express Anger. Anger is a natural emotion. Teach your children proper ways to express it. Teach them to use their words. Show them how to express their anger through art, writing, and physical activity. If you have custody, you may bear the brunt of your child’s anger. It may help you to know that your child sees you as a safe target, someone who can take the anger and still be there to give love and protection. That shows your child trusts you with his or her emotions. Explain to Your Children Why You Parent Alone. Children feel more secure when you explain what is happening or has happened to cause your home to have only one parent. Speak at an age level all your children can understand. They have vivid imaginations and limited experience. When they put these two factors together, they think of some amazing reasons for their experiences. Without an explanation, they often carry this incorrect thinking into adulthood. The best way to combat these false assumptions is to ask children what they think. You will probably be surprise at the answer. Be Reliable. The loss alone causes children to feel insecure. After all, the world they trusted let them down. Begin to rebuild your child’s trust and security by making sure you always let your children know where you are and what to expect of you. They may fear abandonment, so if you are running late call and let them know. Spend Time with Your Child. You may think, “Well, this goes without saying. Of course, I spend time with my child.” That is probably true, but how busy are you trying to spin the same number of plates that two parents struggle to spin in a day. When was the last time you actually got on the floor and played with your child? If it was last night, I applaud you. Your child needs time alone with only you. As often as possible, plan together without siblings, grandparents, friends, or your date. You don’t have to do anything. Just hang out. One-on-one time helps children feel special and allows them a chance talk openly about feelings. Provide Opportunities for Your Children to Build a Relationship with Another Adult You Trust. Especially during the time of grief, children need an adult outside the immediate they can confide in, possibly a Sunday school teacher, scout leader, or a Growing Seasons facilitator, can listen objectively. Be Sure Your Children Feel Loved. Most parent love their children, but many kids don’t feel loved. During a time of grief when children have lost the familiar family routine, they need an extra dose of love. Forgive. forgiveness leads to true emotional health. Bitterness saps energy and causes physical problems. Your actions may hurt the object of your anger, but your angry feelings only hurt you. For yourself and for your children, prayerfully work toward forgiveness. Allow Grief. Let yourself grieve and you give your children the freedom to grieve. Grief requires a tremendous amount of energy, but unresolved grief resurfaces when you least expect it, causing physical and emotional pain. Try to remain in control, but let your children see you cry if necessary.